Does your business or store sell lots of little items or in contrast, very heavy items? Do children visit your business? Do you have multiple vendors that could use help transporting their supplies? If you answered yes to any of these questions, your business probably needs more than the standard plastic or wire shopping cart. Just imagine what a competitive edge you could have if your store utilized specialty carts from Good L Corporation. These carts can make the overall experience at your store more positive. Let’s explore your options for specialty carts! It’s exactly what it sounds like: a basket with wheels. This is perfect for customers who are only picking up a few items or if everything they are purchasing is on the smaller side. It’s definitely a good compromise between a full-size shopping cart and a carrying basket. You’re giving your customers ample options with this cart. Plus, there is a second handle for carrying which allows for it to be rolled or carried. 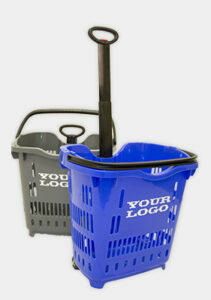 Roller baskets are especially great for those picking up a few items when those items happen to be heavy. If you’ve ever found yourself straining to carry a full basket around a store, you’ll understand just how helpful roller baskets can be. You won’t have to see your customers dealing with sore hands or shoulders, or constantly putting their baskets down for a break. Roller baskets can make a shopping experience that much more comfortable for your customers. In contrast to the roller basket which is ideal for transporting small items, the cargo cart’s purpose is maneuvering large items. The weight capacity is 440 pounds which means that you’ll be able to haul extremely heavy objects. This is especially important to have if your business or store sells heavy duty products, such as a hardware store does. A notable feature on the cargo cart is its retractable upper basket. If needed, you can use it or move it out of the way. Our cargo carts are roughly the same size of a standard shopping cart but are without the limitations of a standard basket. You’re able to use a basket cart in the way that works best for them items you’re putting on and in it. These carts are miniature versions of the standard shopping cart fit to make young children happy while their parents get their shopping done. These carts allow children to pretend that they’re shopping alongside their family, which in turn helps prevent meltdowns. 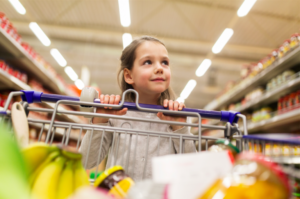 If the kids are content, the parents are able to get errands done and potentially buy more, which results in an all-around positive experience. All in all, child carts create a win-win scenario for you, the child, and their guardian(s). It’s quite likely that if you are operating a business or store, you are also working with vendors who supply the products you sell. Wouldn’t it be nice to have tote carts available for their use? A tote cart is a cart designed to carry heavy items in totes. The sky’s the limit with these carts. Their purpose is to make it much easier to get totes from point A to point B. Plus, your suppliers will thank you for offering this option to them, and it might even increase their productivity. In addition to vendors, these type of carts could also be used if you sell items in bulk. Tote carts are bound to make the purchasing process as easy as possible! 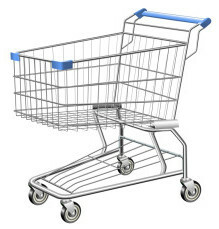 Basket carts are great for stores that are on the smaller side with narrower aisles. If you know that the average customer coming into your store is only looking to buy a few things, a standard sized shopping cart may not be the ideal option for them. A basket cart is the perfect middle ground. It allows people to comfortably maneuver without being bogged down by a cart, should they choose to purchase more than could comfortably fit in a basket. Which Carts Will You Purchase for Your Business? Are you excited to add specialty carts to your business? If you’ve decided that the types of carts mentioned above would be right for you, contact Good L Corporation to make your purchase today. Our specialty carts will help your business thrive in ways you never imagined!